Fascism: A political system in which the state has absolute power and control over censorship of the media and the lives of the people who live under it. Umeboshi: pickled ume fruits common in Japan. As we all know, Adolf Hitler, the notorious leader of the Nazi Party, turned Germany into a fascist state and took many evil and unforgivable actions following the change. 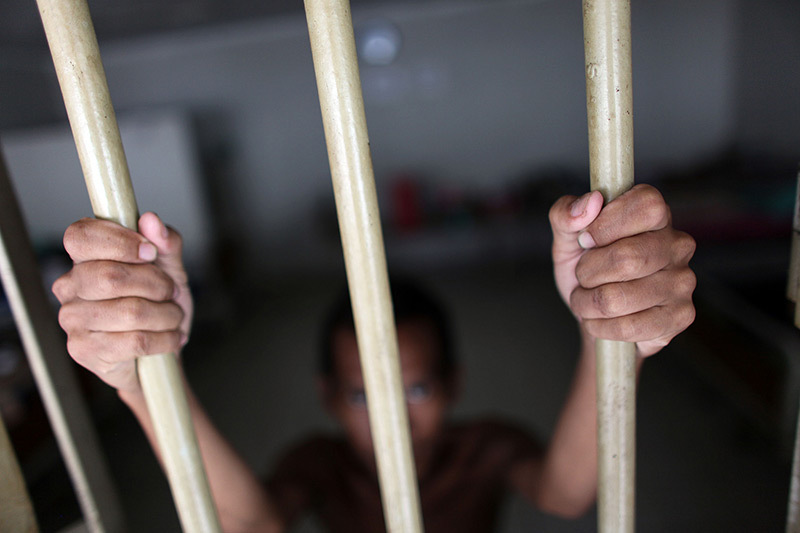 Fascism is a disdainful suppression of human rights. However, history often repeats itself – first as tragedy, second as farce, and third as a Japanese pickled plum. Yes, fascism is on the rise in Minabe-cho in Wakayama prefecture, Japan, and people are calling it… Umeboshi Fascism. But first, though, we should talk about what umeboshi is. Some may know, others may not. Feel free to skip this section if you do. Umeboshi, aka Japanese salt plums, are pickled ume fruit (Japanese plums). They are extremely common in Japan not only because they have a dramatic, tasty flavor, but also because they are very healthy and medicinal (though eating too many may result in too much salt intake!). One interesting health point about it though is that it has a paradoxical alkalinizing effect on the body. This means that the acidity in the umeboshi actually helps to neutralize the acids inside your body. An eye for an eye, I guess. In addition to this, umeboshi also helps to neutralize fatigue, stimulate digestion, provides many good minerals, improves blood circulation, and promotes the elimination of toxins. Not bad for a little pickled plum! 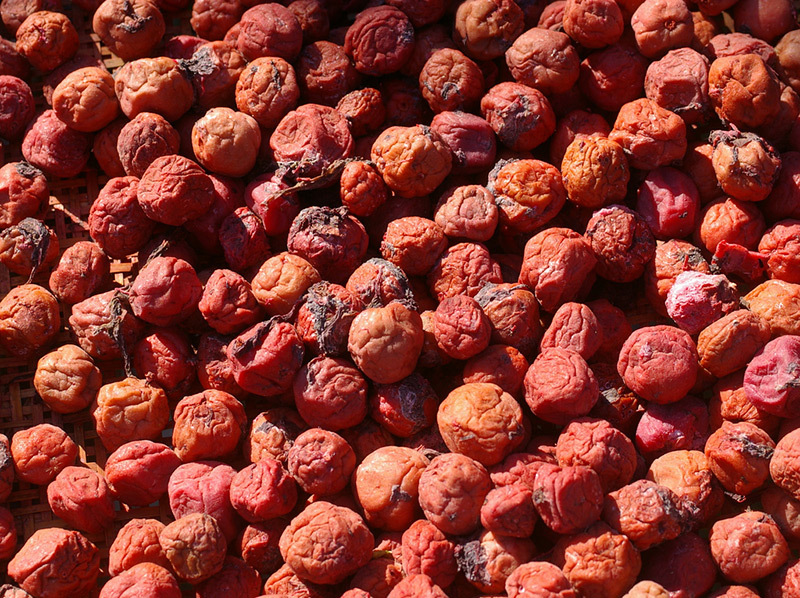 The actual origin of umeboshi itself is obscure, but the oldest record dates back to around a thousand years ago. This record confirms that it was used as a medicine to cure specific diseases, such as dysentery, typhoid, and food poisoning. Not only that, it was also used to prevent fatigue, purify water, and rid the body of toxins. Umeboshi has proven itself quite useful, especially during Japan’s furious samurai period, as it was the soldier’s most important field ration, mending battle fatigue and purifying their water. 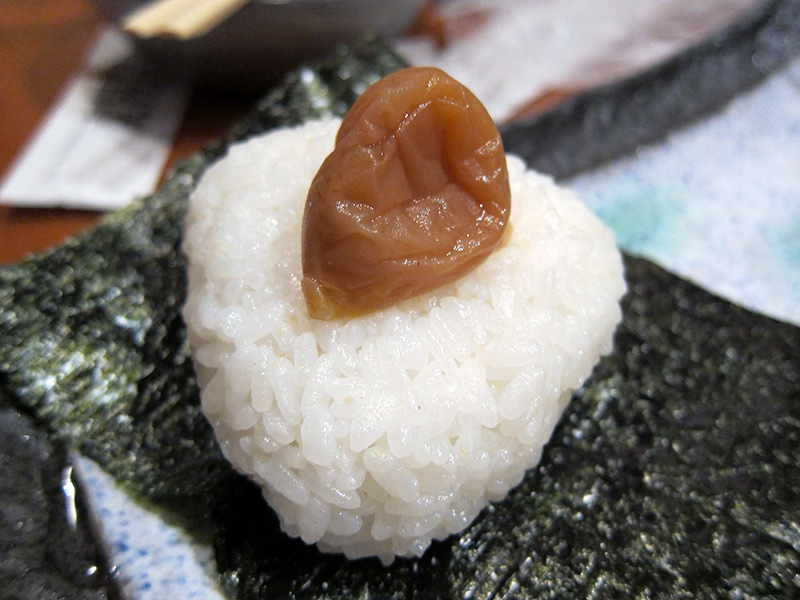 Although in those days, like today, umeboshi were typically used to flavor rice or vegetables, the most common usage, perhaps, was to flavor onigiri, aka rice balls. I’m pretty sure that remains unchanged even today. Now that you know what umeboshi is, let’s cut to the chase: why the fascism? On September 26, 2014, the “Must-Use-Umeboshi-For-Onigiri” ordinance was passed in Minabe-Cho, Wakayama Prefecture, Japan. 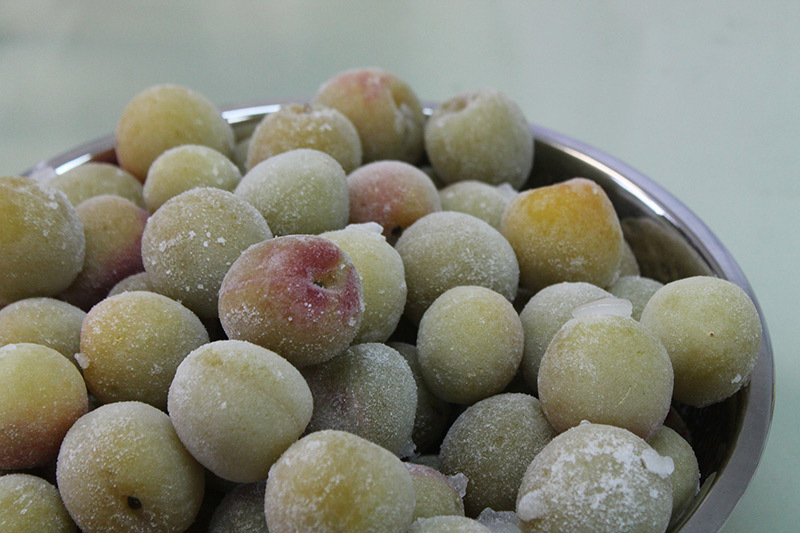 Minabe-Cho also happens to be the largest producer of ume fruit in Japan. As the name of the ordinance suggests, the only ingredient that may be used in onigiri is… you guessed it! Umeboshi. It certainly places a severe restriction on the freedom to choose whatever ingredient someone may like to flavor their onigiri with. To be honest, though, umeboshi is very good with onigiri and one of my favorites, but sometimes I’m in the mood for some tuna-mayo, salmon, bonito, konbu, bacon, or another tasty onigiri ingredient. When I imagine myself as one of the Minabe residents, where all of those wonderful flavors are prohibited, I simply shudder all over. It is obviously a flagrant, but fairly delicious, violation on human rights! Upon reading up to this point, you might be wondering why they made such a bizarre ordinance in the first place. The reason is actually very simple: Although Minabe-cho produces one-third of the nation’s total volume of ume, consumption has been decreasing year after year. In fact, last year’s annual umeboshi consumption per family was just 754g, compared to 1053g in 2002. That means that consumption has dropped more than 25% over a decade. In retaliation to this trend, they are forcing their residents to only use umeboshi for their onigiri. They also thought it would help to appeal to other parts of the country in that such a bold act would show how truly serious they were about their one, special product. “How selfish was that? Wasn’t anyone against it?” I asked myself. After some research, I found out that they passed this ordinance by unanimous consent. In other words, 14 of 14 members voted “Aye” for this to happen. 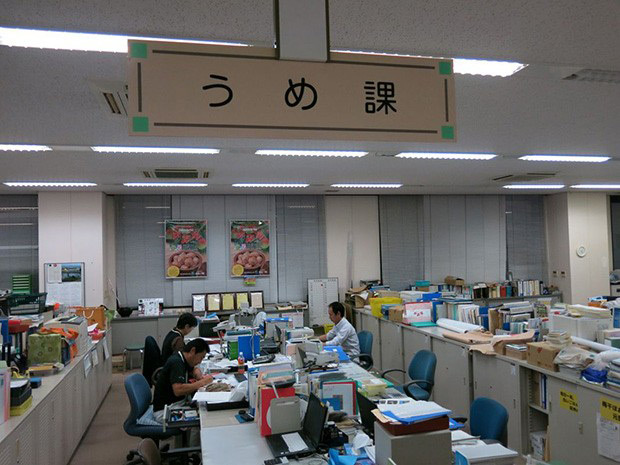 More surprisingly, now their city hall even has an “Ume Department”. How could this happen? Do these Minabe people love umeboshi so much that they don’t need to eat other kinds of onigiri? I got even more curious. Umeboshi is unpopular. The most popular ingredient is konbu seaweed. Umeboshi onigiri don’t sell well. Many more customers buy tuna-mayo onigiri. It’s a bit sad that umeboshi is actually unpopular in the area where the majority of umeboshi in Japan are produced, isn’t it? Now, you may be feeling pity for them and may also be beginning to understand why they made such a regulation, but can we really abide this infringement? If anyone is going to be tired of all-umeboshi-all-the-time it’s going to be the people who live in the place that makes one-third of the ume in Japan. Shouldn’t they be allowed to eat what they want? It would be like taking someone who works at McDonalds, and telling them that from now on, they could only eat McDonalds hamburgers, even when they weren’t at work. They should be allowed to eat what they want. Plum-kobo is one of those stores and they put a recipe for “tuna-umeboshi” onigiri on their website. Just to introduce one of their tips, they suggest that you cook the rice with umeboshi already in it because it makes the rice nice and shiny as well as giving it a delightful flavor. To me, an umeboshi hater, this ordinance is craziness. However, I couldn’t find any bad opinions from the people of Minabe about this. For example, I did a quick interview with a woman who is from Minabe and her comment was as follows. Anyway, Minabe’s umeboshi is really tasty, so I think it’s an awesome choice for an onigiri ingredient! What!? A Minabe resident doesn’t really mind? The answer made me feel like I was tricked. The above-mentioned Netallica also interviewed a town council member, Mr. Shimomura. Here is the Q&A. Since it’s called ordinance, if someone goes against it, would they have pay a penalty of some sort? Well, it looks like this fascist rope I’ve been pulling on wasn’t actually tied to anything real. It was just a publicity stunt to gain some attention for umeboshi throughout the country and they succeeded pretty well. But wait a minute. When history repeats itself, will we notice? We’d better keep our eyes peeled so that they don’t start secretly punishing residents for eating non-umeboshi onigiri. 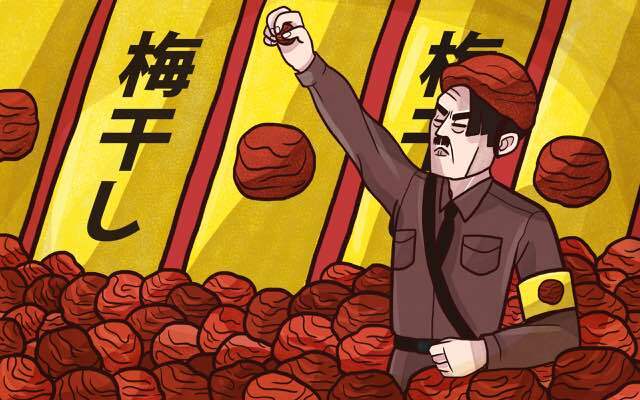 If we do a plum job of it, we might never see this umeboshi fascism become a real thing.